Rothenburg ob der Tauber, Germany is one of the most picturesque towns in the world. The colorful, walled city looks like the setting of just about every Disney movie ever made. Roam through the cobblestone streets long enough and you may actually start to feel like Belle in the movie Beauty and the Beast. Children and adults of all ages will find this charming town quite magical. It truly is like stepping into a fairy tale! Aesthetics aside, the small town along Germany’s famous Romantic Road boasts several must-see attractions. 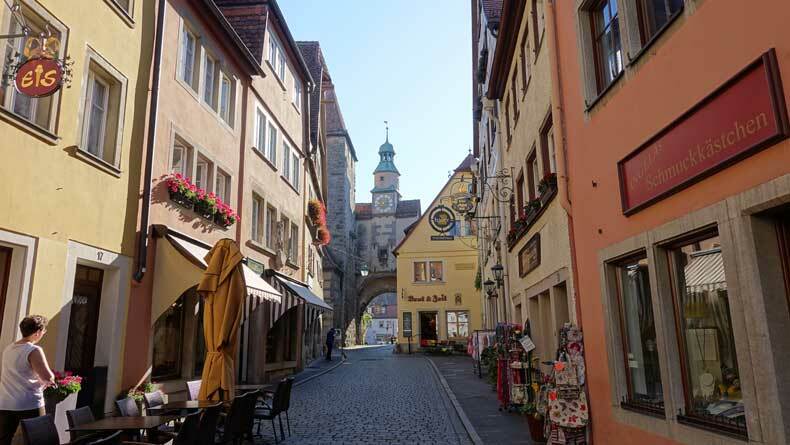 There are surprisingly a lot of things to do in Rothenburg ob der Tauber, Germany. 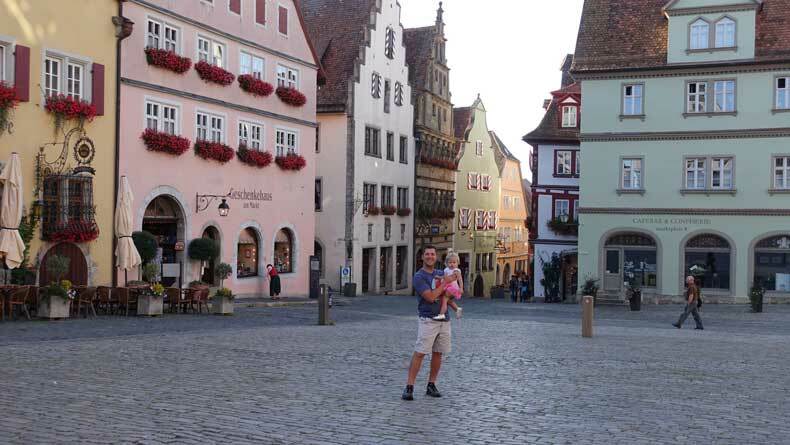 If visiting Rothenburg ob der Tauber with kids, they will have just as much fun in this family-friendly town as you will. How many days should you spend in Rothenburg ob der Tauber? 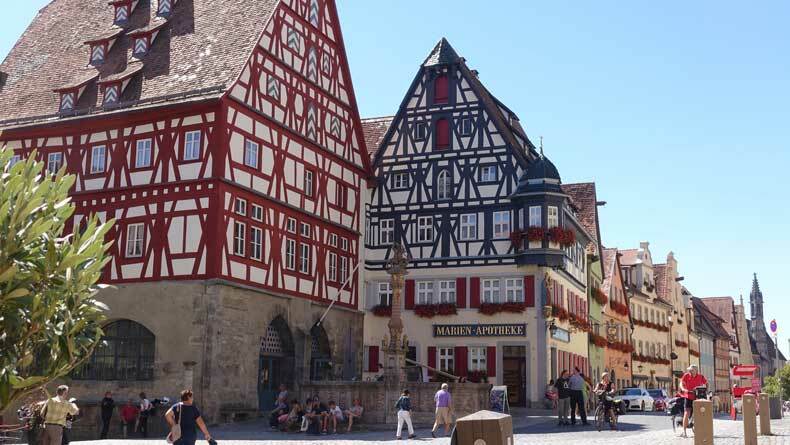 Many people visit Rothenburg ob der Tauber as a day trip from Munich or Frankfurt. Others stop for a few hours, or at most spend one night. However, giving yourself a couple of days in Rothenburg ob der Tauber allows you to experience everything this small town has to offer. 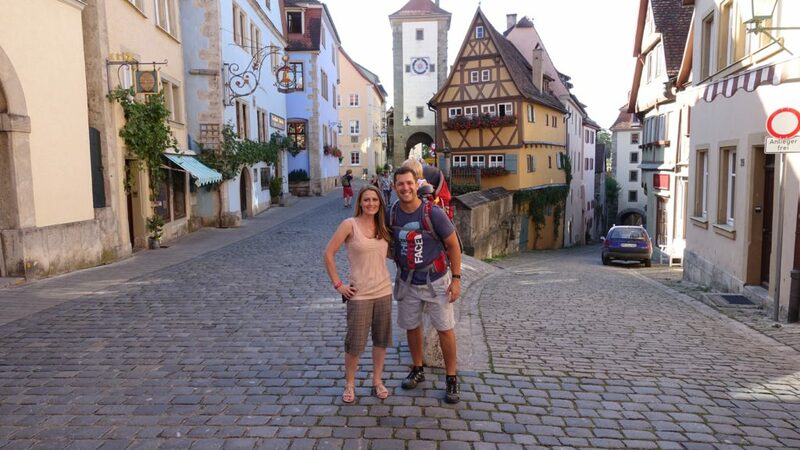 We spent two nights at a charming hotel in the center of Rothenburg ob der Tauber. When traveling with kids, I always recommend giving yourself a little extra time, especially if you are dealing with jet lag, which we were. I’m glad we had the additional day or so to relax and truly take in the entire town. I think one weekend in Rothenburg ob der Tauber is the perfect amount of time to visit the sights and enjoy the magic of this little Bavarian village. 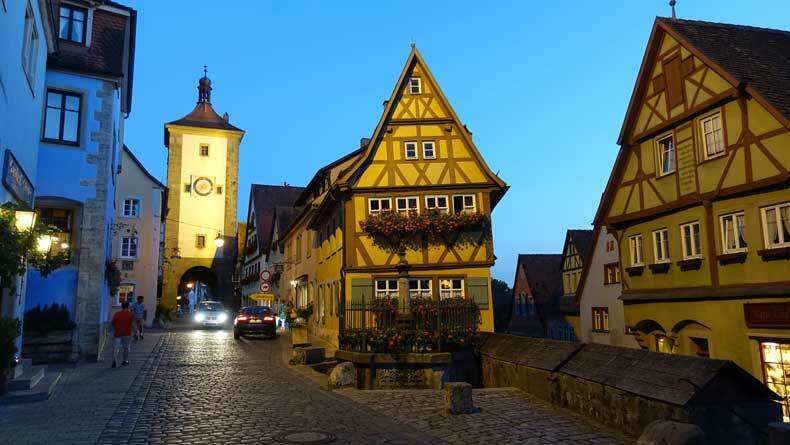 Rothenburg ob der Tauber is perhaps the most popular stop along Germany’s Romantic Road. The town attracts tourists year-round, and it’s easy to see why. While adults will enjoy the medieval charm of the cobble stone streets and storybook buildings, children will love it, as well. 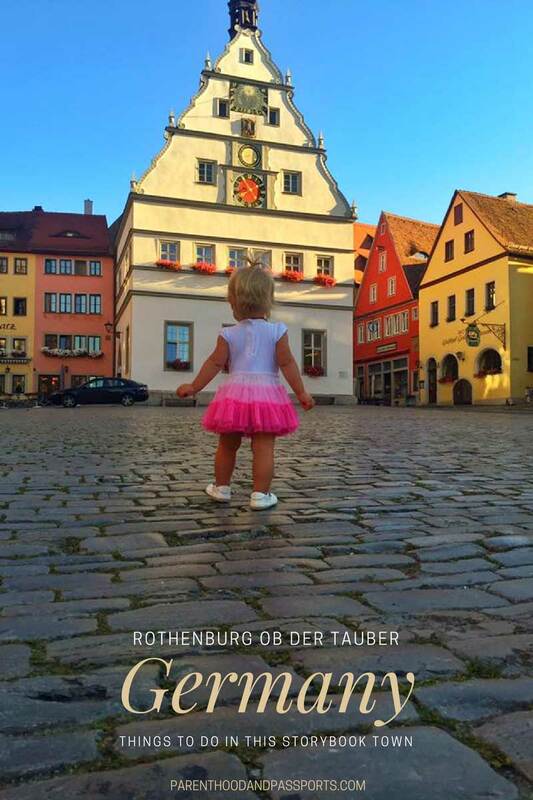 In fact, few towns that we have visited cater to children the way Rothenburg ob der Tauber does. 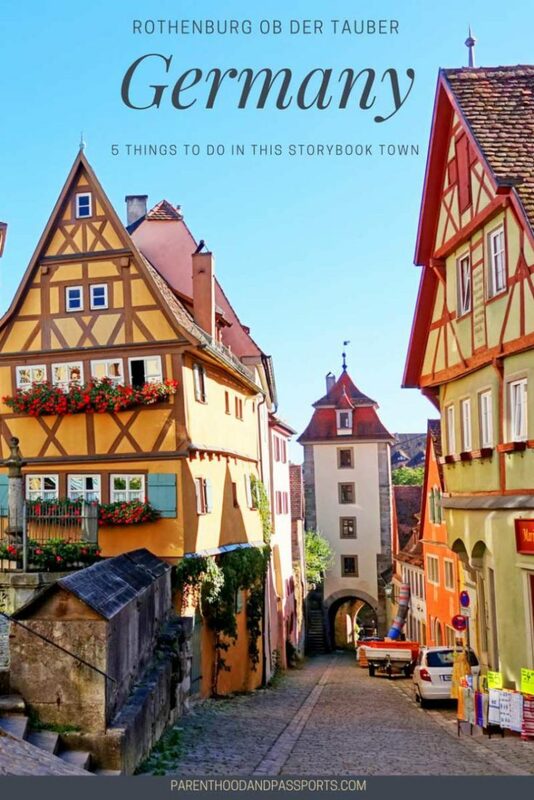 If you only have a short amount of time, here are the top five things to do in Rothenburg ob der Tauber. The medieval town of Rothenburg ob der Tauber is one of the best preserved walled cities in all of Europe. Even during World War II, the Allied forces found the town too quaint to destroy. For this reason, they sent negotiators in and the city surrendered without a fight. Part of the wall did come down during the war, but much of the original wall remains. It is just a short climb up one flight of steps to walk on the wall and get a beautiful view of the town, the rolling hills, and the vineyards that surround it. Walking on the wall is free and safe for families. There is a side railing to protect from falls and plenty of openings for smaller children to peer out. Rothenburg ob der Tauber is the Christmas capital of the world and is home to a great little Christmas museum. Tucked inside a beautiful Christmas store just off the main market square, the museum walks you through the history of Christmas, and how the holiday’s traditions and decorations have evolved through the years. Young kids will love the colors, lights, and stimulating sights of the museum, while older children and teens may actually learn something about the Christian holiday and it’s pre-Christianity origins. It is inexpensive to visit, costing about $4.50US (€4) per person or approximately $9.00US (€8) for a family of four. The museum is open year round as is the Christmas store where you can buy souvenirs, ornaments, and unique Christmas decor to take home. Love Christmas? 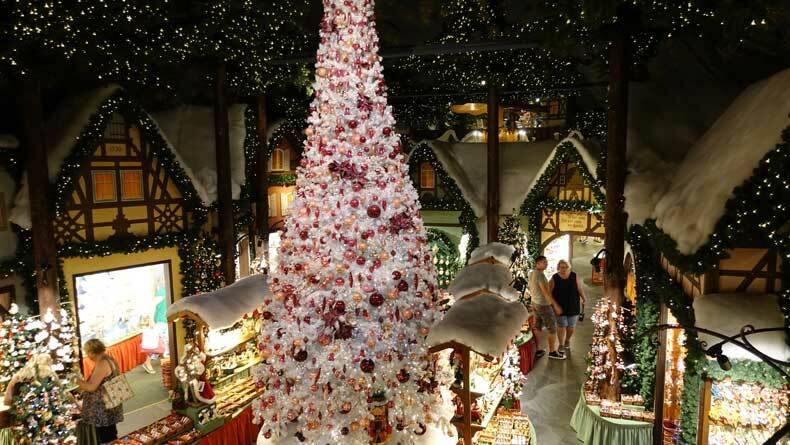 Check out this post for other great Christmas destinations around the world. 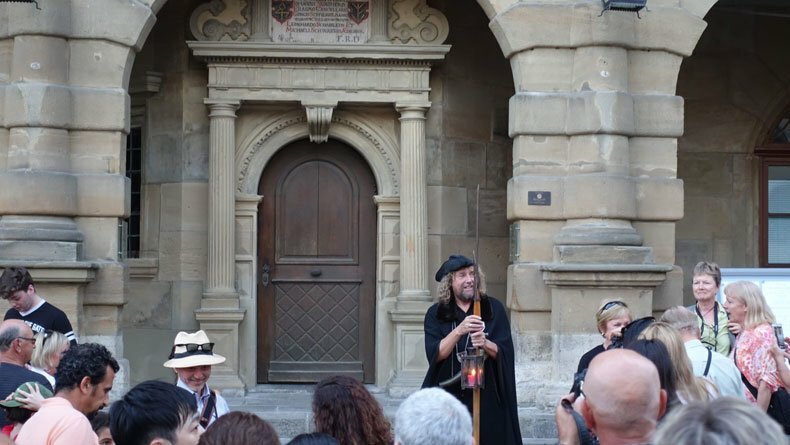 The Night Watchman’s tour is one of the most popular guided tours in Rothenburg ob der Tauber, and it’s fun for adults and kids alike. The one hour tour starts at 8pm, so younger children may have to stay up past their bedtime for this one. 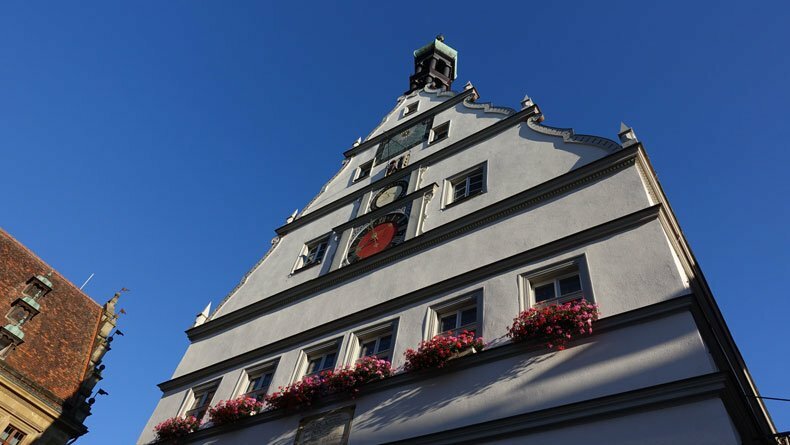 But if you are looking for unique things to do in Rothenburg ob der Tauber with kids – or without – this is a neat, family-friendly experience. The night watchman leads the tour from the Marktplaz square dressed in his traditional medieval attire. 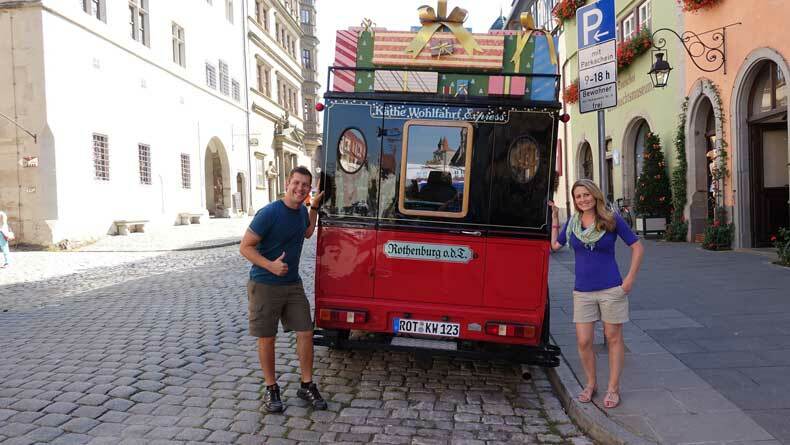 He takes tourists back in time during the one-hour walk through the narrow cobblestone streets. The night watchman recounts historical stories, legends, and even adds humorous antidotes as the group weaves through the brightly colored, enchanting buildings inside the city walls. 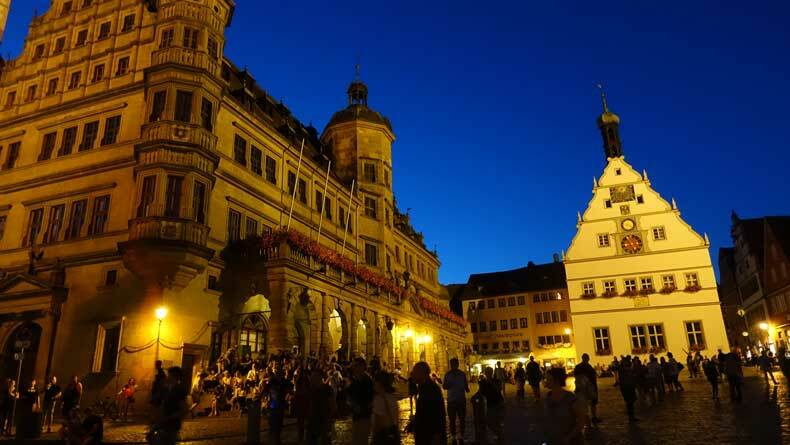 The Marktplaz is the town’s central square and meeting place in Rothenburg ob der Tauber. One of the prominent features of the square is a lovely clock that chimes every hour. The animated clock comes to life as it chimes. The small windows next to the clock’s face open up and characters are seen drinking their steins of beer. Outdoor cafés and bakeries line the square as well as the small streets surrounding the Marktplaz. These offer great places to sit and enjoy a nice lunch, dinner, a coffee, or a refreshing German beer. A must-try dessert while in Rothenburg ob der Tauber is the schneebälle. This deep-fried, powdered sugar-covered dough ball is a popular treat in the small town. Don’t miss this while in Rothenburg ob der Tauber, because the pastry is hard to find anywhere else in Germany, or the world for that matter! What Christmas capital of the world would be complete without a spattering of toy stores? There are several toy stores inside the city’s walls that sell unique toys, dolls, and children’s souvenirs. 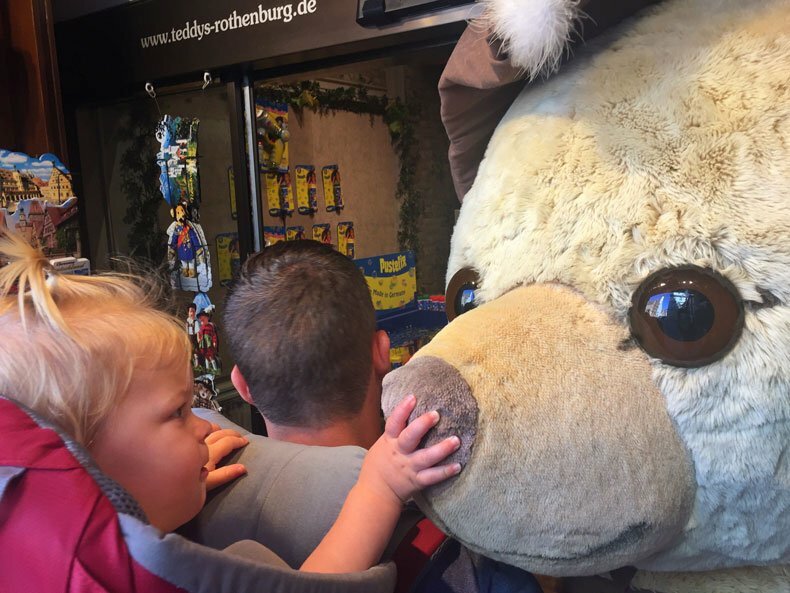 If you are visiting Rothenburg ob der Tauber with kids you will want to check out one or two of them. 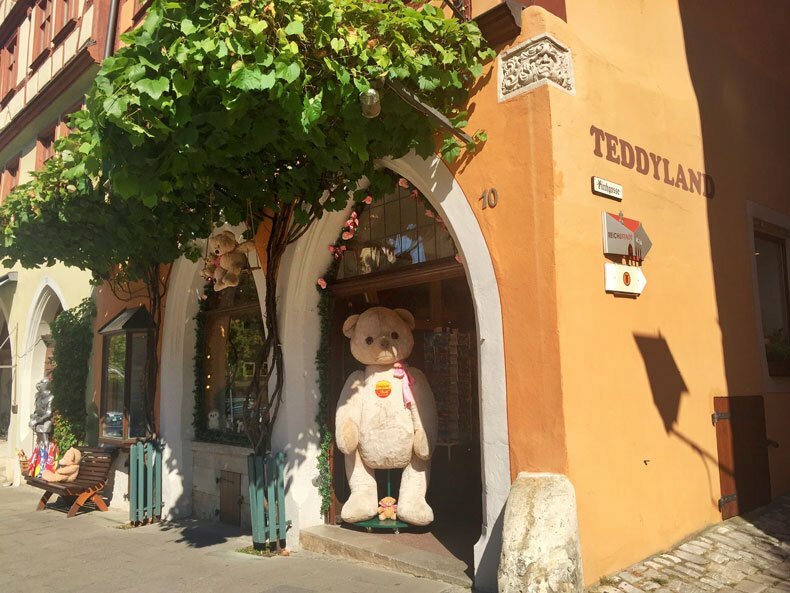 Don’t miss Teddy Land, a toy store dedicated specifically to teddy bears. It was a personal favorite of ours. Our daughter loves stuffed animals, so this was a fun little store to visit. 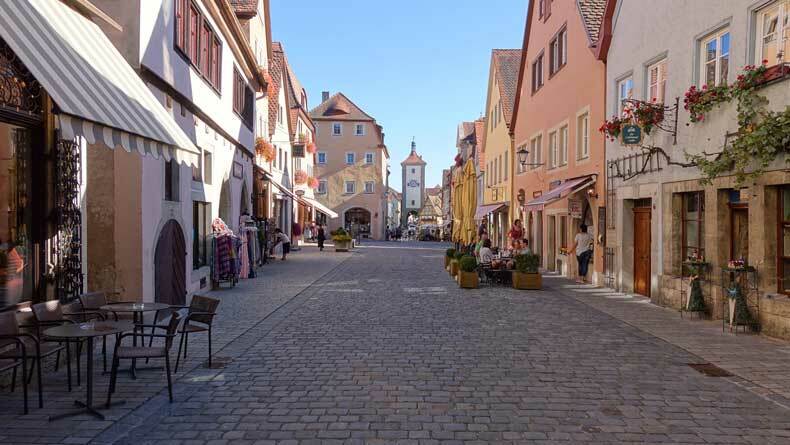 While the town of Rothenburg ob der Tauber is a perfect destination for families, the cobblestone streets aren’t really stroller-friendly. For this reason, if you are traveling with a baby or a toddler, I always recommend a child carrier. The one we use has a 48 pound weight limit, so even older toddlers who get tired of walking could be carried in the backpack. If a child carrier isn’t your thing, I’d recommend a lightweight, durable jogging stroller for the cobblestone streets. The larger wheels of a jogging stroller will help you navigate a bit more smoothly on uneven or bumpy surfaces. 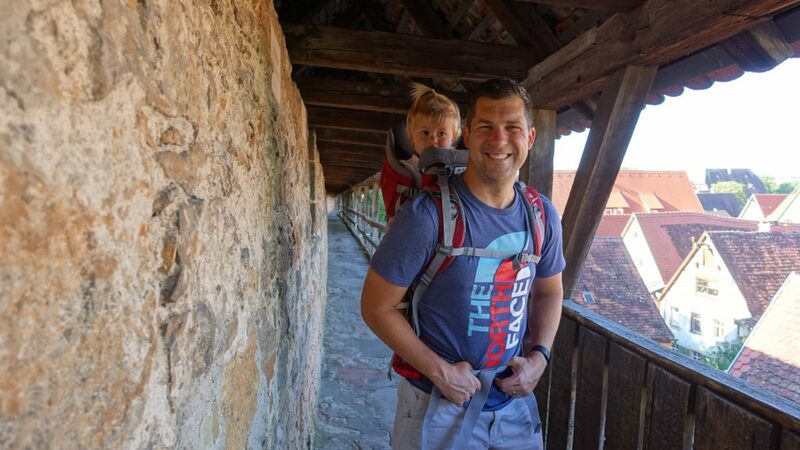 CHECK OUT OUR COMPLETE REVIEW OF THE DEUTER CHILD CARRIER THAT WE USE. The picturesque German town of Rothenburg ob der Tauber is a photographer’s dream destination. Every street offers Instagram-worthy views. And the stunning buildings with their flower-filled window boxes and breathtaking medieval architecture will bring out the romantic in everyone. Here are a few more of our favorite photos from our visit. 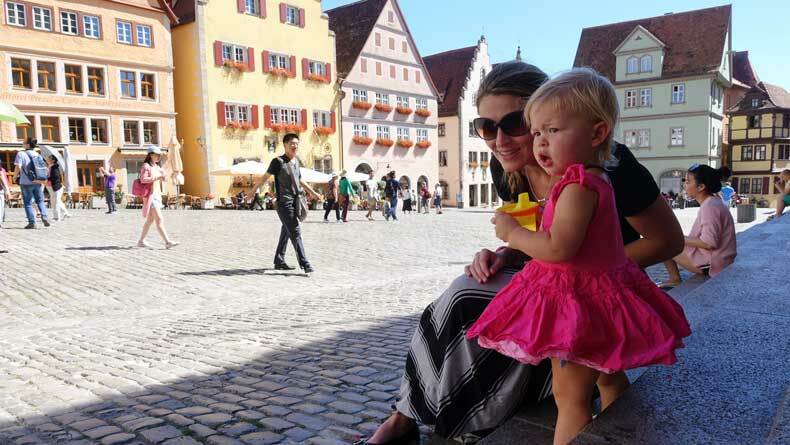 Have a comment or question about things to do in Rothenburg ob der Tauber with kids? We’d love to hear from you. Leave your thoughts in the comments below. Wow, it does look out of Disney! My favorite holiday has always been Christmas so looks like I need to visit this adorable town! Yes it does! It might be one of the prettiest towns I’ve ever visited. Yes! Us too. It sure beats checking a stroller every time we go somewhere. Such a cute little town! Reminds me of Bruges, I kept saying that it looks like something out of a fairytale. Your daughter is so cute!! She reminds me of my little one at that age. Thank you! She is at such a fun age. I’ve never been to Bruges, but I’ve seen pictures and thought it was such a pretty town. Thank you! It’s so much fun showing our daughter the world. Looks so beautiful! Would be lovely in Winter too I’m guessing. Supposedly it is extremely popular in winter, especially around Christmas time. I’ve heard they decorate the entire town like a Christmas village. Love all the things you recommended! Love the backpack you have for your little girl! Perfect for travel! We loved Rothenburg ob der Tauber too! It did feel like being in a Disney movie! I may or may not have walked around singing Disney songs while we were there. ? Thank you! We took so many photos there because everything is just so picturesque. OMG, your daughter is adorable 😛 And Rothenburg looks like a fairytale!! Love the medieval feel. I would like to check out that Christmas Museum!!! Thank you! She is a fun little travel companion! And Rothenburg is a fairytale town and the Christmas Museum is definitely worth a visit if you ever go! It is definitely touristy but adorable and worth a visit! Sometimes I like to mix it up and get out of the big cities like Munich for awhile and stay somewhere a bit more relaxing. Rothenburg ob der Tauber looks like a movie set. It looks like an amazing place to walk around in and just take in the views. I can already tell the Christmas Museum will be my favorite stop. We spent so much time just wandering around taking in the charm of this town. There were plenty of streets that were empty or nearly empty too so it was easy to get away from the crowds, which I loved! 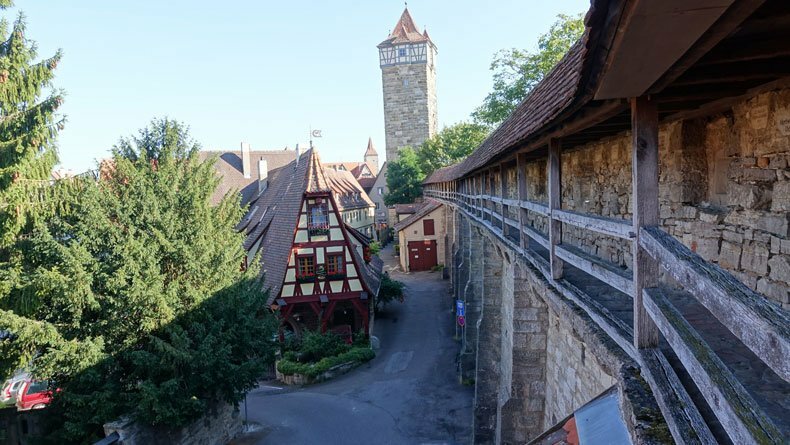 Where do you recommend staying in Rothenburg? 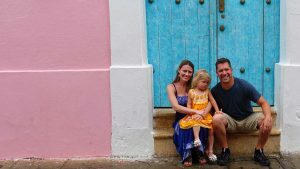 We will be traveling with a 3 year old and a 1.5 year old. Thank you for the post! A beautiful family! We are planning to go in the autumn by train. 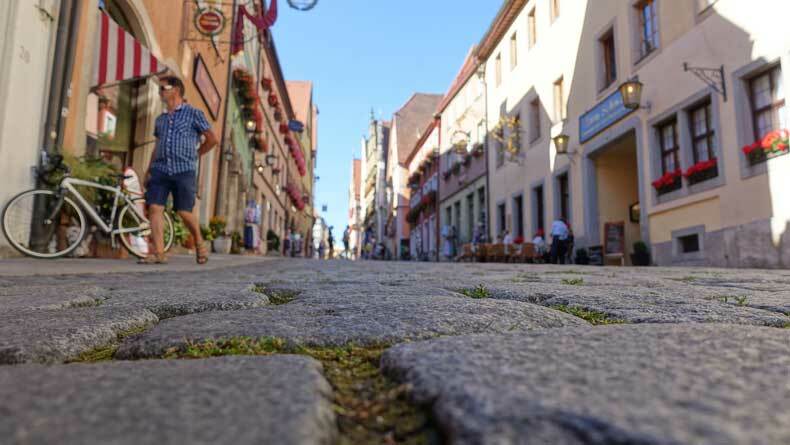 Do you know how far it is from the train station to the entrance of Rothenberg ob der Tauber by walking? Any restaurants you would recommend? From the main plaza and our hotel, it is about a 15 minute walk to the train station, so about 7 minutes to the edge of the walled village. Definitely walkable. The restaurant inside Hotel Eisenhut is great. 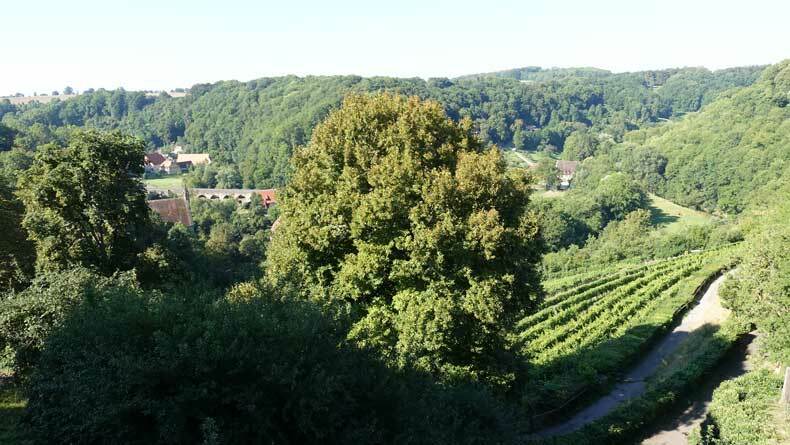 They have a back patio that overlooks the valley and vineyards outside Rothenburg ob der Tauber. There are also several beer gardens right off the main plaza where you can sit on a nice enclosed, shaded patio. If traveling with kids they had games and toys to keep them occupied. Hope this helps!